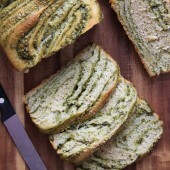 A flavorful savory bread with streaks of thick pesto throughout. Heat water to 115°F. Dissolve yeast and sugar in warm water. Allow yeast to proof. To the bowl of a stand mixer, fitted with dough attachment, add flour and salt. With mixer running on low, slowly add yeast mixture. Increase speed to medium high, mixing until dough comes together in a clean ball. Shape dough into a smooth ball, transfer to a lightly greased large bowl. Cover and allow to rise for one hour or doubled in size. Meanwhile, prepare pesto sauce in a food processor. Blend together basil and garlic. Add cheese, blending quickly. With lid on and food processor running on low, slowly drizzle in olive oil. Roll out dough on a silicone counter mat into a 10 x 20-inch rectangle. Spread pesto sauce out to 1/2-inch from edges. Starting at one of the shorter sides, tightly roll up dough, pinching edges as you go. Using a sharp knife, carefully slice completely through dough, end to end. Braid dough. Carefully transfer to a lightly greased 10-inch loaf pan. Sprinkle with Parmesan cheese. Lightly cover and allow to rise for an additional 30 minutes. Preheat oven to 350°F. Bake for 40 minutes or until internal temperature reaches 190°F. Cool on a wire rack. Store in an airtight container. Recipe serves roughly 10, yields 1: 10-inch loaf. Troubleshooting dough tips: If dough is too sticky, add a spoonful more flour until ball forms. If dough is too dry, add a spoonful of olive oil at a time until a ball forms.